Laser Institute of America (LIA), the professional society for lasers, laser applications, and laser safety worldwide, is thrilled to announce the dates and location for the 2018 Lasers for Manufacturing Event (LME®) & Laser Additive Manufacturing Conference (LAM®). LAM® will take place March 27–28, 2018. LME® will commence March 28–29, 2018. Both will be held at the Renaissance Schaumburg Convention Center in Schaumburg, IL, USA. Celebrating its tenth consecutive year, the Laser Additive Manufacturing Conference (LAM®) features presentations discussing where and how to apply additive manufacturing concepts, with a distinct focus on laser technology. Topics to be covered at this year’s event include Additive Manufacturing Applications, Selective Laser Melting, Laser Metal Deposition, Design for Additive Manufacturing, Process Monitoring, Metal Feedstock, and 3D Software Tools. Lasers for Manufacturing Event (LME®) is an interactive exhibit, created with the intent of increasing the awareness and application of lasers in manufacturing. At LME®, laser specific solution providers are available to answer questions and provide demonstrations to those who may be new to laser technology or are looking to source new equipment for their manufacturing needs. Attendees will also have the option to attend a complimentary education track, as part of the exhibit. Topics of interest at this year’s LME® include 3D printing, Additive Manufacturing, Cutting, Drilling, Marking, and Welding. Details regarding registration, guest speakers, special topics, lodging, and more are forthcoming. 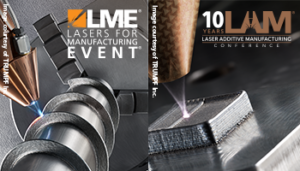 For up-to-date information regarding the 2018 Lasers for Manufacturing Event (LME®), please visit www.laserevent.org. Updates for Laser Additive Manufacturing Conference (LAM®) will be posted to www.lia.org/lam.